IPU CET Application Form 2019: IPU CET is also Known as GGSIPU CET or Indraprastha University Common Entrance Test is a university level examination. The IPU CET Application Form normally released in the month of February to provide admission in various UG & PG programs such as B.Tech, LLB, M.Tech (IT, CSE, IS), MCA, BCA, LLM, MBA (IT), MA, M.Sc, BHMCT, and MA. To get admission into these courses candidates have to fill the IPU CET Application Form and complete their preparation before the IPU CET Exam Dates. All the events and their dates will be declared with the official notification, But till then here is the Tentative IPU CET Application form Dates of 2019. Admission into MBBS, BDS, BHMS & BAMS will be done on the basis of NEET UG Score. So Candidates have to Appear and qualify the exam, but for other courses, Candidates have to full fill the prescribed IPU CET Eligibility Criteria. Some of them are given below. minimum 55% marks in PCM. B.Tech (LE) B.Sc or 3 years diploma with mathematics subject & minimum 60% marks. BCA Passed 12th or equivalent exam obtaining minimum 50% marks. With English and Mathematics/CS subjects. LLB Passed 12th or equivalent exam and English subject obtaining minimum 50% marks. M.Tech In relevant field B.Tech/BE, M.Sc, MCA or equivalent degree holders. With minimum 60% marks. MBA Any bachelor’s degree or ICAI, ICAW or equivalent exam passed. With Minimum 50% marks in the qualifying exam. MCA Bachelor’s degree holders in any stream with minimum 50% marks. LLM LLB or equivalent law degree with minimum 50% marks. 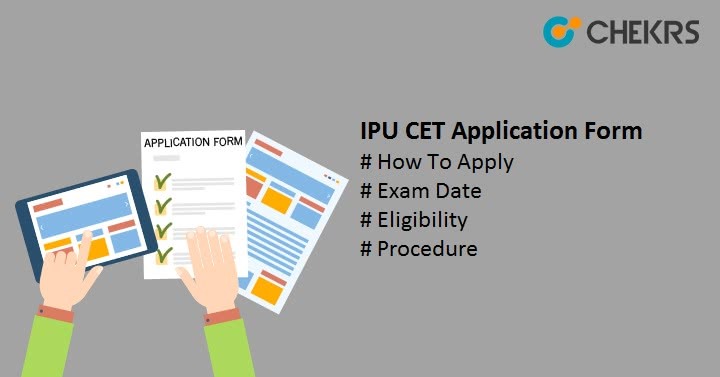 Candidates can apply for IPU CET 2019 using the complete procedure given below. Now here we are going to explain every single step. Visit the official website of Indraprastha University Common Entrance Test ipu.ac.in. Click on “Apply Online” Option. A tinny form for registration will appear here, Enter all the asked details. And Click on Submit/ Register. Now Candidates will receive login details on the provided Email id and Phone number. Visit the IPU CET Official website and Login There Using the login Details. After logging in the GGSIPU CET Application Form will appear, Fill all the Asked Details like Personal Details, Communication Details. Qualification details. Upload scanned photograph, thumb impression, and signature in the acceptable/prescribed format. After Filling the application form and uploading the images pay the required Non-Refundable IPU CET Application Fees. The fee can be paid through Online Mode via Debit/ Credit card or Net Banking. The Fee for GGSIPU/ IPU CET Application form will be Rs. 1000/- for each course. Must know that the fee is non-refundable so be sure to fill this application form. Also, make sure to take print-out of the payment receipt and dully filled application form.